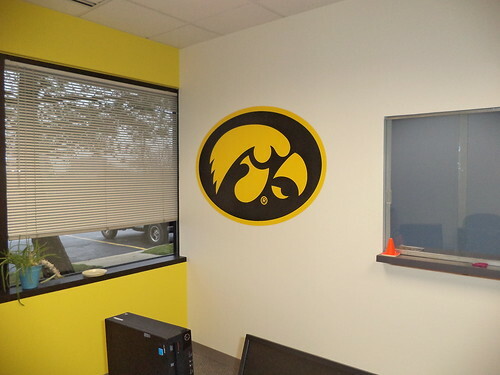 In getting my office set up, one of the things was going to be the big tiger hawk on the wall behind me. My boss nixxed that idea. He said it looked like a recruiting statement for Iowa and that's not what he wanted people to see when they walked in. 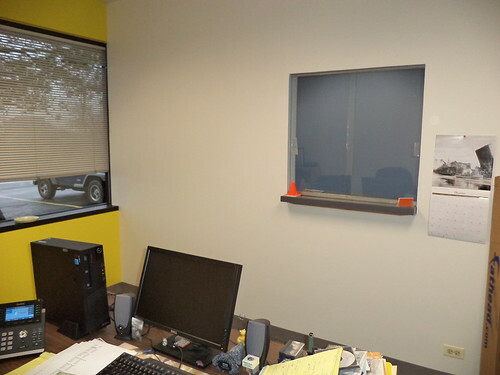 But, I was allowed to put a large tiger hawk on the wall with the window. I was disappointed. I had my heart set on displaying my team. He acknowledged my disappointment but it just wasn't want he wanted our first impression to be. I guess I can see his point. 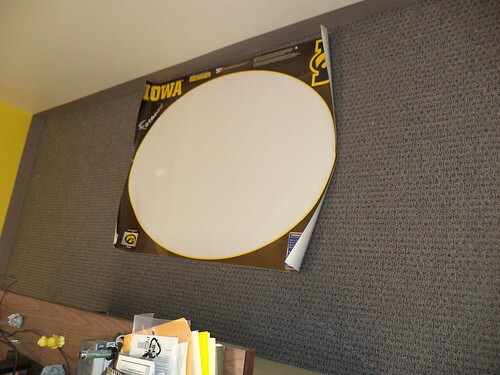 In December, while watching the Big 10 football title game, there were ads for Fathead wall decals. I had looked at wall decals but I wasn't about to spend $110 for a logo. On a whim, I checked out the site and discovered their decals were 20% off with free shipping for the holidays. That put the decal I wanted at $60. I thought about it. Was it worth it to me to spend $60 for the immediate ability to festoon the wall with a tiger hawk? Yes. Yes it was. I had no idea how big this thing actually was. This is the box. It arrived the Monday before Christmas. You might have heard the squeal as I came home and saw it on the front porch. The next day, I took it to the office. The decal comes in a heavy duty cardboard tube inside the box. 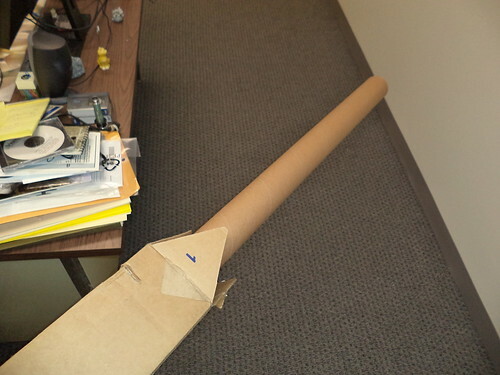 You know how you'll still bonk people on the head with an empty cardboard gift wrap roll? You don't want to do that with this. It's really heavy duty and would hurt. 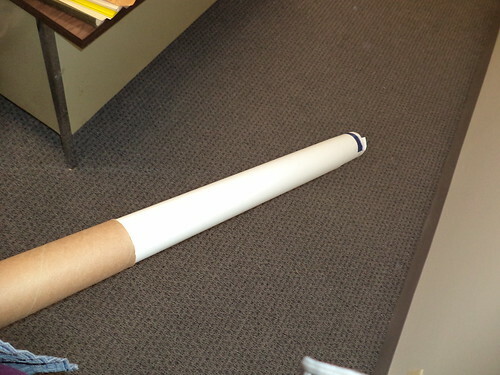 Inside the tube is the rolled up decal. 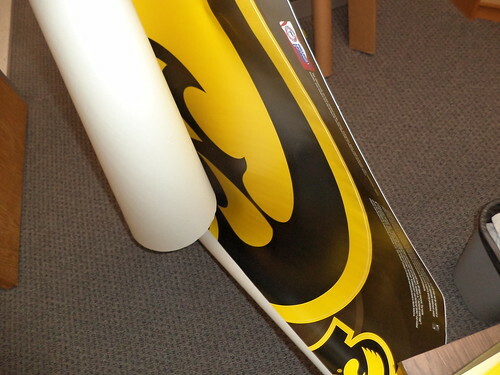 Again, there might have been a squeal of delight which evolved into a bigger squeal when I unrolled the decal itself. It's beautiful. Gene happened to be in the office at the time, so I had him help me apply it to the wall. It couldn't be easier. You peel it off the backing and position it on a clean wall. I admit to having something of an advantage because the wall was a bit over a month freshly painted but you should have a clean surface to adhere to. We had to move it a bit to make it square, but once on the wall, you just press it down. I have other icons on the decal I could use. The Iowa name and the tiger hawk "I" don't really go with anything else at the moment. I'm thinking of offering them to siblings for their walls. This is what my wall looked like before the decal. I have "Historic Chicago" 2016 calendar to the right of the window. The orange cone says, "Give me all your chocolate and no one gets hurt" and my business cards are to the right corner of the window. I would have spent hours and hours trying to trace something onto this wall; trying to get the colors right, the angle right. I would have put it off because I knew how long it would take me. I am thrilled.